One of the best ways to make the most out of a limited space is to use it for more than one purpose. Some people, for instance, set up their home office in the living room, while others have their workout space in the bedroom. Tables can serve many purposes. 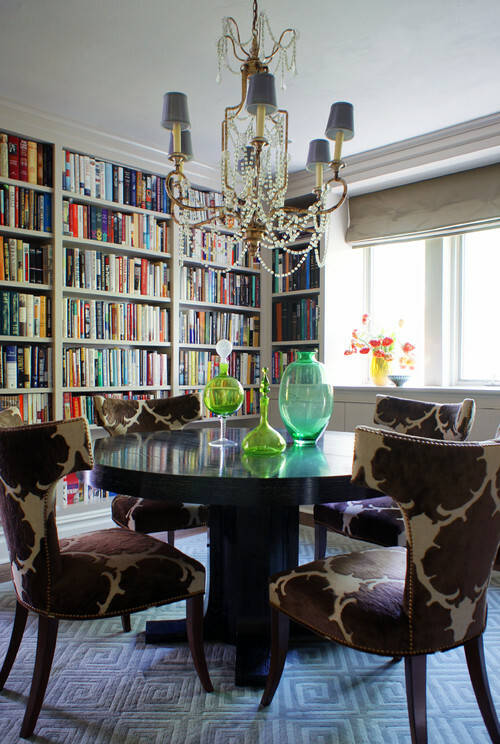 To make the most of them, at the same time maximizing space, hold both the dining area and the library in a single room. Not only is this combination practical, it looks charming too! Most people think that a large sofa can overwhelm a small living room. But setting up sectionals actually makes perfect sense for a cramped space. Although larger than a single couch, sectionals provide more seating and they take up a smaller footprint compared to the usual sofa and chairs set-up. Sectionals are also particularly efficient in maximizing a corner of a room where wall space is limited. In this room, sectionals open up floor space while defining the living area. 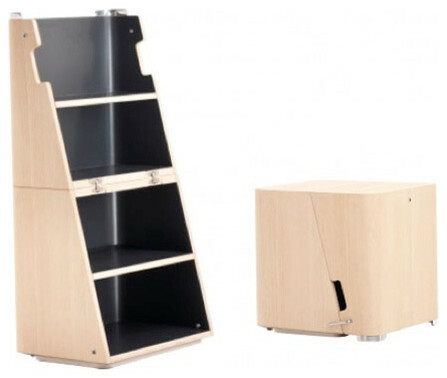 Most free-standing furniture takes up a lot of room. Effectively utilize space by choosing built-in instead of traditional pieces. Placing shelves in nooks and crannies is a great way to reclaim space and provide storage. 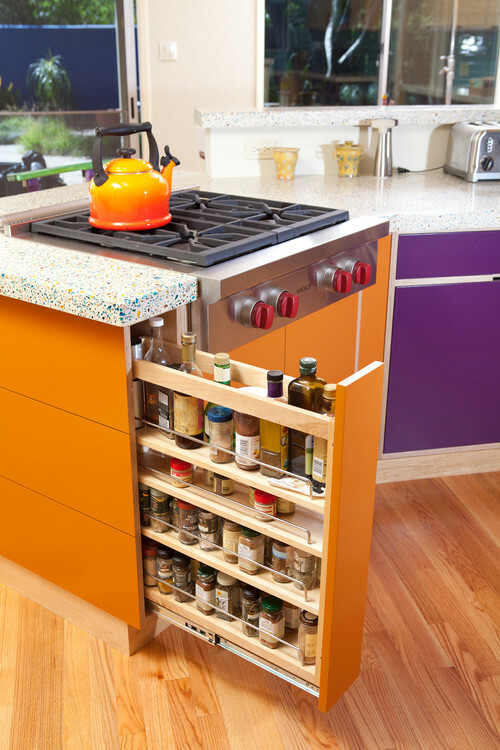 A real space-saver, the sliding rack below this stove top allows easy access to spices while cooking. Provide extra seating without taking too much space by using window seats. Add drawers below for extra storage. 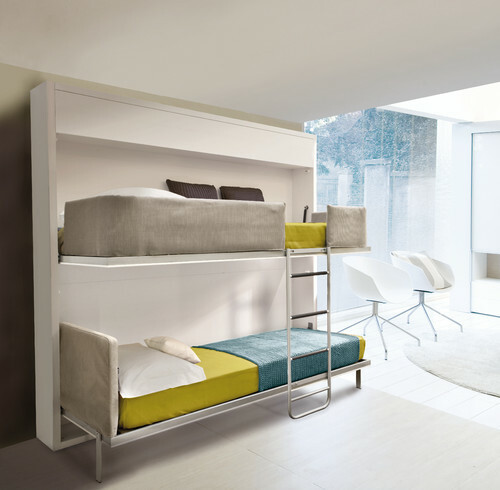 Modern Kids by San Francisco Architects & Designers Feldman Architecture, Inc.
Products that are compact, collapsible, or multifunctional are a fantastic way to conserve space, especially in small rooms or apartments. This collapsible home office unfolds like a wardrobe trunk to reveal shelving on one side and a computer workstation on the other. Casters allow tucking the whole unit out of the way when you’re done with office work. Its ability to transform into a stepladder makes this multipurpose stool/side table an extremely handy option, especially for rooms with lofts or upper cabinets. And if that’s not enough, you can also use it as a bookshelf! Great for small studio apartments or bedrooms that also function as living rooms, this stylish furniture features two beds that neatly fold up into a blank wall. 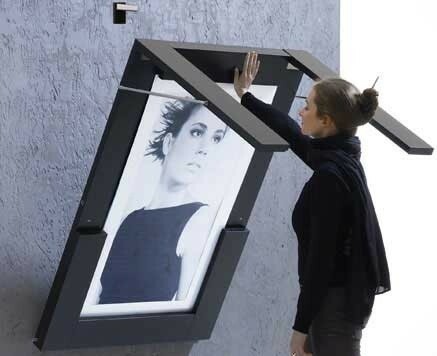 A very clever arrangement, this table for five transforms into a framed artwork when not in use. Unfolding the table is easy since you only need to unlatch the top and straighten out the legs. With these small home designs, you can easily maximize space to make every room seem larger than it really is. These tips, coupled with organization, help you simplify your décor to live more efficiently.